I'm not sure what could be the reason but I'm not getting the great battery life as everyone says. I'm trying to figure it out but I've seen people with eight hours of screen on time. 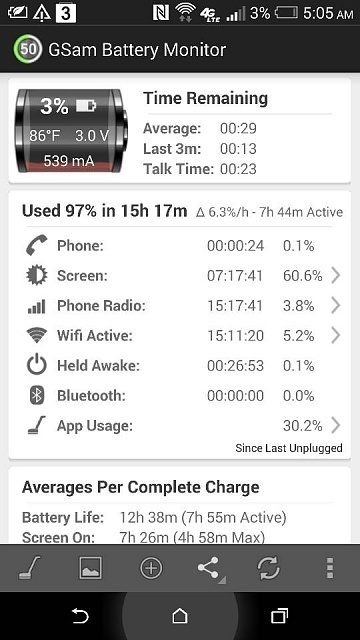 I don't know what's the reason my battery seems pretty average. I'd say that is pretty good. 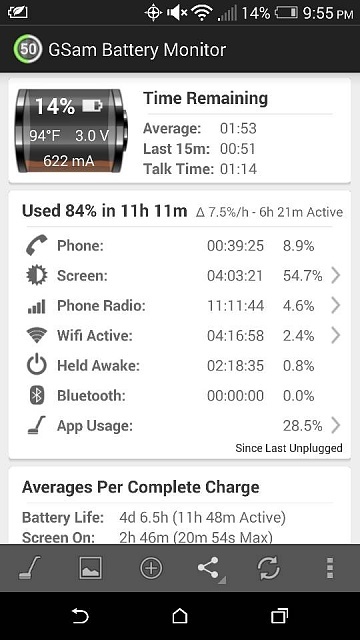 11 hours on battery with about a third of that with the screen on if on par with what others are getting. What is your screen brightness set at? Also, I see you only have 1 bar of signal strength, how is the coverage in your area? 2+ hours of wake time too. Something is keeping your phone awake. I haven't had one charge since having it since April 4th go under 6 hours screen time. 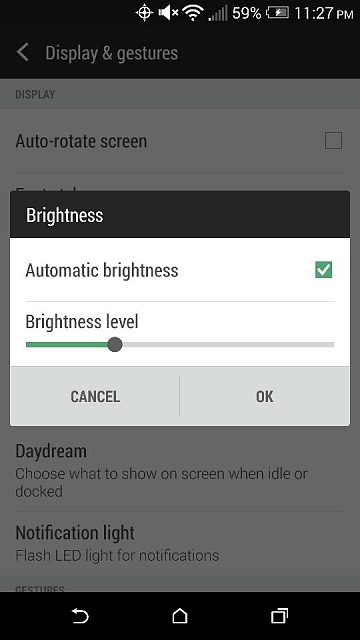 Once 14% hits with power saver on you will get another 30-40 mins easily with the auto brightness enabled. This is my best stat to date. That's how I pretty much always have my brightness set to, also yeah I always have about one bar of LTE everywhere, I'm in the metro Detroit area, Dearborn more specifically so I'm not sure if that's what's causing it. I've heard CDMA is more of battery killer than GSM but I didn't think it the difference would be that noticeable. Yeah I don't know why my battery is not lasting as well as others. Having that much screen on time is great. Do you have conserve CPU usage on when you turn on power saver and when do you have it turn on? Keep in mind a smartphone is still a phone. It will kill itself to maintain a weak voice signal. When did you get the device? I got the phone on April 2nd. I thought though that the voice signal is completely different from the data signal, like I will have one bar of LTE but when I place a call it will show the bars for CDMA and I will have full bars. Looks fairly good to me for a stock battery, 11 hours with over 4 of screen on usage. Okay I might give that a try and see what I can figure out, I mean four hours of screen on time is still pretty good, but I'm only thinking it's average because of some people managing six to eight hours of screen on time. Says your app usage is 28.5%. Could it be a rogue app at all? I've yet to get under 6 hours screen time on my One. Battery life has been stellar for me. Ok, so the battery is past it's break in cycle. But yes, a device will kill itself for such a weak signal. I'm not sure, I will have to check again tomorrow and report back to see how it goes. Yeah that's what I mean I managed to break four hours of screen on time before power saver kicked in which is why I'm questioning my battery a little bit. I managed to get 2 days and a half with medium intensity usage on the phone, the only trick was activating plane mode while sleeping at night. I would say the battery is amazing. This is how my battery life was today. Still not that good with CDMA only and I had power saver on for a couple of hours too. Text smiley faces not showing?? Moto G MMS not working.